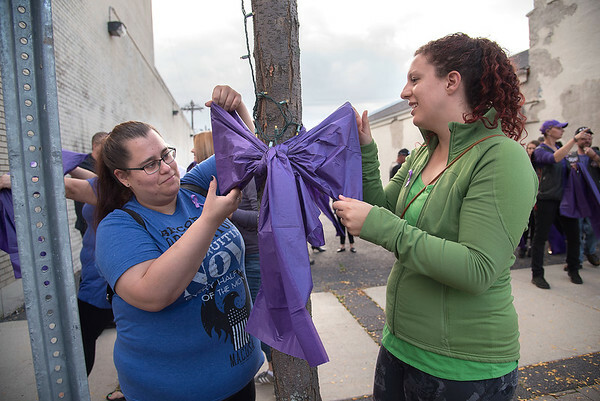 Niagara Falls, NY - Participants Rachel Lopez of Niagara Falls and Heather Gouthro of Youngstown tie a ribbon around a tree as part of the 4th Annual Domestic Violence Ribbon Walk on 3rd Street in Niagara Falls. Family & Children’s Service of Niagara, Inc.
Niagara Falls, NY – In recognition of Domestic Violence Awareness Month, Family & Children’s Service of Niagara is coordinating the 4th Annual Domestic Violence Ribbon Walk on Tuesday, October 10, 2017 starting at 4:30 PM. The walk will begin at the corner of Main and Third Streets in Niagara Falls. Following brief remarks, the participants will take a collective stand against DV as they walk down Third Street tying purple ribbons on the trees between Main and Niagara Streets. Participants are asked to wear purple for the Ribbon Walk. Immediately following the Ribbon Walk the public is invited to experience a survivor art exhibit at Wine on Third, 501 Third Street in Niagara Falls. The theme of the art exhibit this year is “Permission Canvases & Affirmations from a Birdie.” The art work was created by adults and children of Passage House shelter, the only domestic violence shelter in Niagara Falls. The exhibit will be on display through October. The event is free and open to the public. Awareness is the theme of such an event; 1 in 4 women are victims of domestic violence; in 2016, Passage House Domestic Violence Services answered over 500 calls on the 24/7 domestic violence hotline -(716) 299-0909- and provided shelter to an average of 9 survivors and their children per day. Awareness about the prevalence of domestic violence educates the community about the services available and brings people hope: 98% of survivors served in Passage report they now feel more hopeful about the future. Founded in 1895, Family & Children's Service of Niagara, a private, non-profit agency, has been providing the residents of Niagara County with a wide range of community social work services for 122 years. The agency has been providing domestic violence services in the Niagara community for more than thirty years; and in 1989 Family & Children’s Service opened Passage House, the first fully staffed domestic violence shelter for abused women and their children in Niagara Falls.